Animals cannot live without oxygen. Plants cannot live without CO2. Plants produce the oxygen but are also the major source of food for most animals. Most political leaders are pushing to reduce the amount of CO2 in the atmosphere because people like Al Gore tell them CO2 is at the highest level ever when it is actually at the lowest. 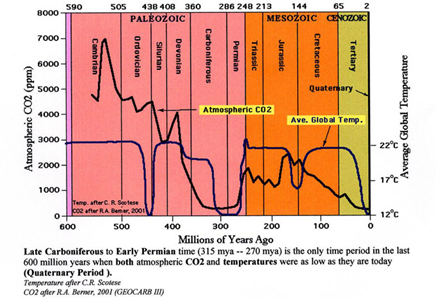 Figure 1 shows the level of CO2 against temperature for the last 600 million years. The official claim figure given for atmospheric level of CO2 is 400 ppm on the right side. CO2 became the focus of a premeditated orchestrated political agenda to demonize it as the toxic byproduct of fossil-fuel driven industries causing runaway global warming. It is impossible to determine human effects if you don’t know or understand natural patterns or causes, and we don’t. Of course, they know few will read the report and even fewer will understand, and they can easily marginalize people who point out the truth. The definition of climate change used by the IPPC narrows everything down to CO2. The distortion was so effective that claims about greenhouse gases (GHG) led a major US news network to post false information on their website. Figure 1 shows an ABC News pie chart. The graph shows only 4 percent of the greenhouse gases. Carbon dioxide is only the “majority” because they ignore the 95 percent that is water vapor. Gross misinformation about CO2 is everywhere. President Obama calls it ‘carbon,’ a solid, when he means CO2, a gas. He talks of “carbon pollution” and falsely labels CO2 a pollutant. Few know the facts, and many ignore them for political, or financial reward. 1. CO2 is called a greenhouse gas (GHG) because it reportedly allows shortwave (SW) solar radiation to pass through the atmosphere and reach the Earth’s surface. This heats the surface, and that heat is radiated back out to space as longwave (LW) radiation. The greenhouse analogy claims that the earth’s atmosphere is like the glass that allows SW in but stops heat LW escaping. It is a false analogy. It suited the narrative because everybody associates greenhouses with warmer temperatures. 2. There are three major GHGs. They are by volume; water vapor (H2O) 95%, carbon dioxide (CO2) 4%, and methane (CH4) less than 0.3%. 3. 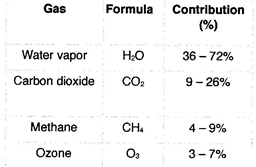 CO2 is approximately 0.0397 % of the total atmospheric gases. 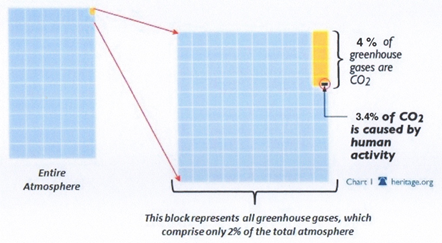 Figure 2 shows the proportional relationship between atmospheric gases and GHGs. 4. The IPCC assume an increase in CO2 causes a temperature increase. It doesn’t. Every record for any period shows that a temperature increases before CO2. The only place a CO2 increase precedes a temperature increase is in IPCC computer models. 5. The amount of CO2 was inconveniently small, so they concocted an effectiveness value. This claimed that each CO2 molecule reduced LW escape at a higher level than a molecule of water vapor. The trouble is the range of estimates shown in Figure 3 varies considerably. If this effect follows the laws of physics then all calculations should give the same results. 6. Let’s assume CO2 is causing warming. Then, when its density reaches a certain level, the warming ability is maximized. It is currently maximized, so the addition of more CO2 has little effect. Consider light passing through a window. One coat of black paint blocks most of the light and subsequent coats block only fractionally more. Doubling or tripling atmospheric CO2 has little further temperature effect. To bypass the problem, IPCC theorized a positive feedback. Higher temperature due to CO2 increases evaporation and more water vapor causes increased temperature. It doesn’t exist. In fact, the feedback is negative partly because of increased cloud cover. 7. 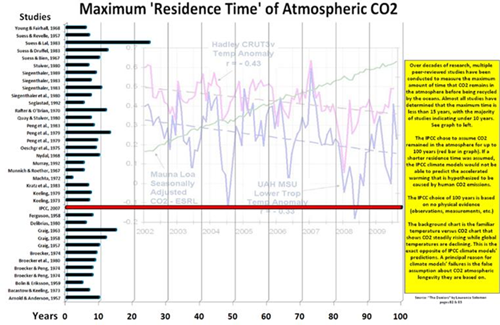 The IPCC said the CO2 we put into the atmosphere stays there for 100+ years, called the residency time. It supported their claims that even if we stopped production now, the problem would persist, and if we didn’t stop, amplification through accumulation would increase the impact. Figure 4 shows the residency times from dozens of researchers against the IPCC claim. Figure 4 The faint background chart shows temperature decline from 2002-2010 against CO2 increase. 8. Annual human production levels of CO2 are produced by the IPCC and are lost within the error factor of two natural sources; oceans, and soil bacteria/decomposition. 10. All official atmospheric levels of CO2 are measured by a system created on Mauna Loa, patented and owned by the Keeling family. Ernst-Georg Beck explains how Charles Keeling established the readings by using lowest afternoon readings while ignoring natural sources. Beck notes, “Mauna Loa does not represent the typical atmospheric CO2 on different global locations but is typical only for this volcano at a maritime location in about 4000 m altitude at that latitude.” Keeling’s son operates Mauna Loa and as Beck notes, “owns the global monopoly of calibration of all CO2 measurements.” He’s also a co-author of the IPCC reports. 11. 20th- century temperatures increased most from 1900 to 1940 with little increase in limited human production of CO2. Human production of CO2 increased most from 1940 to 1980, but temperatures went down through that time. 12. 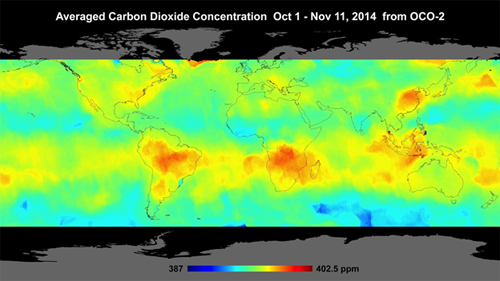 The IPCC assumes CO2 is uniformly distributed in the atmosphere. It is not; it varies considerably as recent satellite imagery showed (Figure 5). In the image, you can see that the largest source of CO2 is the forests and grasslands, not the urbanized areas. China has high concentration, but they are upwind of the industrialized areas. The focus on human CO2 as the cause of global warming and then climate change is wrong on every level, but the deliberate selection, omission, and misrepresentation of the facts allowed them to claim CO2, a gas essential to life on Earth was to blame and must be reduced. All IPCC predictions are wrong because their CO2 facts and science are wrong. Because of their lies, damn lies, and statistics they achieved their goal of demonizing CO2, so the world suffers unnecessarily, as it always has from corrupted, manipulative politicians and leaders.